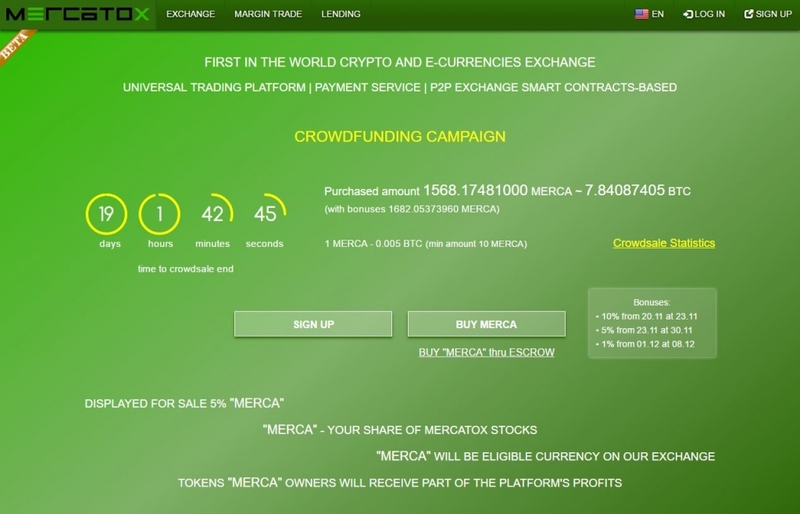 Screenshot of Mercatox crowdfunding site. Team MERCATOX has announced today that it has already released their beta-version and crowdfunding campaign. MERCATOX is a universal commerce platform that combines different types of digital money. MERCATOX platform is set to become a multi-functional trading platform with automated trading functionality, integrated payment processing and P2P exchange, based on “Smart Contracts”. As P2P platform, it will allow exchange of any digital and fiat currencies on the platform. Mercatox is a trading platform for accessing e-currency and cryptocurrency exchange markets. Lending traders. Mercatox will allow traders to raise funds for margin by trading on the exchange as well as for investors to invest and earn income on the loan. Peer-to-peer exchange of electronic currencies, where users can exchange any digital title signs (all the world banks, payment systems, virtual, gaming, cryptocurrency and more). Investors will be receiving MERCA tokens in exchange for Bitcoins, representing a share of the project.